Your integrations page controls high level items about your Walmart integration, like your account credentials, feed options, and other account-wide settings. Here's a breakdown of what you'll see when you click on Walmart Settings. This is an over-arching on/off switch for your integration with Walmart. If this is in "test mode", Zentail will not communicate with your Walmart Seller Center. This determines whether Zentail should treat your orders as live orders or just test orders. If you have this in test mode, Zentail will not route your Walmart orders to any outside integration or fulfillment method. 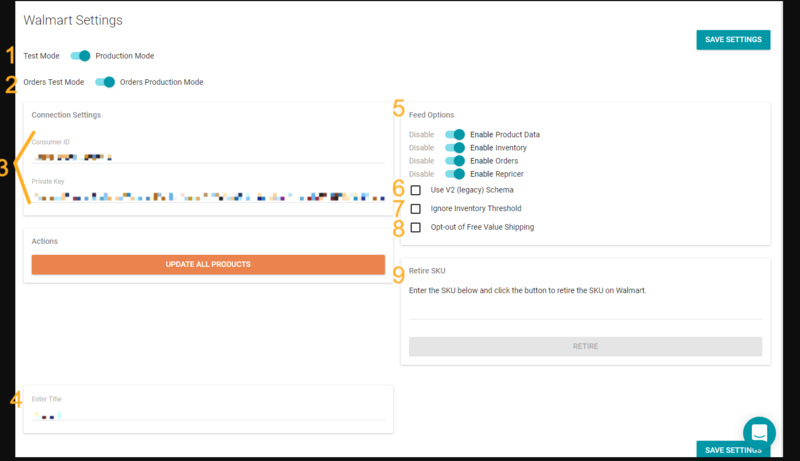 These orders will not appear on your dashboard or analytics within Zentail either. This is where you enter your Walmart Seller Center credentials (like your private key and conumer ID). This allows Zentail to communicate with your Walmart account. What you'd like this integration to be called, like "XYZ Walmart". Note: If you're in the onboarding process, you can leave these alone for now. The Inventory Feed basically asks, "is Zentail allowed to send inventory to Walmart?" However, just because you enable this feed doesn't mean Zentail starts sending inventory information. You'll still need to set a SKU to list to Walmart for the first time. 99% of users will leave this unchecked. When Walmart updated its integration to V3, there was a minor loss in functionality that affects some accounts. But the increase in functionality on the newest integration (like the option to use Keywords and more specific categories) is the best option for most accounts. If you have an inventory threshold in place, check this off if you want this to be the channel where your final units of inventory are available. This option allows you to opt-out of Walmart's free value shipping program for your entire account. It is recommended that this option is unchecked. You can use this tool to retire SKUs on your Walmart Seller Center. In general, this should only be used if you never intend to sell that SKU on Walmart Seller Center again. Learn more about this tool here: How to Retire a Walmart SKU.